Interested in RV camping but not sure where to start? This guide will give you the basics and break down the different obstacles and questions you might encounter, and hopefully get you out on the road faster! An RV (or recreational vehicle) is a motorized or towable camping trailer that is primarily used for living in while traveling or staying in various locations. It can be a van with a bed in it, a pop-up trailer that is small but functional, or even a 30 foot long airstream with all the comforts of home. No matter what it looks like, if you can sleep in it, pull it with a car/truck, and possibly even cook in it then it would be considered an RV. If you don’t have an RV yet, there are several questions you should ask yourself before you rush out and make that purchase. How often are you planning on using the RV? What are you looking for in an RV? Do you have something to pull the RV? Are you looking at buying a gas or diesel RV? How often are you planning on using the RV? If this is for that once a year trip, you might consider simply renting one for several weeks. The cost of maintenance might make it worth your while, as well as not having the stress of storing the RV when you aren’t using it. What are you looking for in an RV? Will you be having the whole family staying with you, or will it be just a few people? How many beds will you need? Are you bringing all 5 cats and dogs with you on the trip? How much space will you really need? Do you have something to pull the RV? Do you already own a truck or similar vehicle that could manage pulling the unit up and down mountain highways? Make sure and check the weight limit that your vehicle is capable of pulling. It would be a shame to purchase an RV and discover after that the RV is too heavy for the truck you already own. What is your budget? A used RV can be found for several thousand dollars, or you could be looking at a luxury model over $100,000. Just depends on how much you are willing to spend. When are you planning on doing most of your camping? If you tend to camp more in the winter time, or in colder climates, you might want to consider purchasing a four season’s camper. They will have better insulation, heated water tanks, and other features that are important to keep pipes and even you from freezing. 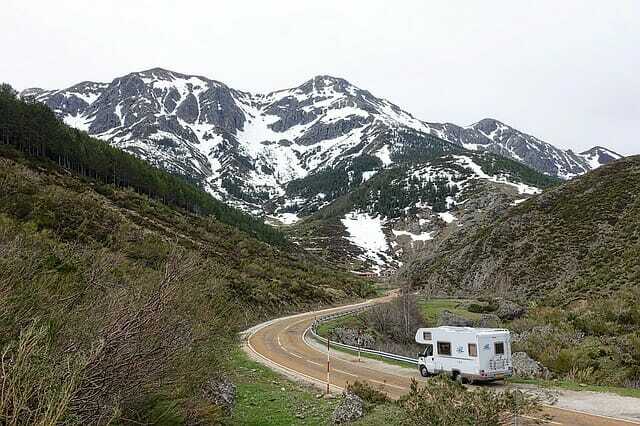 If you are planning on spending a lot of time camping in warmer climates, make sure and look for an RV with air conditioning, and perhaps tinted windows or better insulation overall. No reason to run the air conditioning if all the cold air is simply going to leak out. Size of the RV: not just because you need your personal space, but think about where you will be parking it. If you are a backwoods/small campground kind of person, you definitely wouldn’t want to purchase the largest RV on the market. And vice versa: if you prefer campgrounds with cable tv hookups and campsites that have drive through lots, a larger RV might be just what you need. Are you looking at buying a gas or diesel RV? Everyone has their own opinion on the matter, but we’ll go over a few pros and cons, and you can make the ultimate decision. a) Diesel is a bit more expensive at the pump, but in the long run you will save money on miles per gallon (mpg). Diesel engines also tend to last longer, so when you get around to selling your RV for the next best model, you will get a higher overall price. Diesel engines have more torque than gas engines do. To put it in simpler terms, a diesel engine has more ‘push’ power at lower revolutions, as well as more power in higher elevations. This can be crucial when driving through mountainous areas or up and down numerous hills. Most diesel motorhomes also have a heavier chassis, thus allowing a higher tow capacity. b) But diesel engines have cons as well. They tend to be more expensive in your initial purchase, and maintenance costs might be in the higher range as well. Changing the oil can cost more and take a bit more time. If any maintenance is needed on the engine, the parts and the time needed to fix it might be a bit more labor intensive and expensive than you are willing to pay (or want to pay for that matter). c) Gas fueled motorhomes have their place as well. If you are looking for a more inexpensive RV to get out on the road, than you might want a gas powered RV. They are typically more abundant on the market, as well as being cheaper to fix. Parts for any maintenance will also be less expensive and easier to come by. Mechanics are more likely to know how to fix a gas engine than a diesel one, which might come in handy if you are in the middle of nowhere when something breaks. d) Gas engines do have cons, although most of them have already been mentioned. They don’t have the torque (pulling power) to pull some of the larger RV’s at a quick speed from a slow start, but how fast do you really want to go while driving a big RV? Don’t forget to test drive it! Make sure and hook it up with the vehicle you will be pulling it with, and drive it around. Try to find some hills and drive up and down. Practice backing it up, to see how difficult that will be for future trips. Have you already purchased your RV? Then let’s get you ready to head out on the road! You might consider stocking up on several ‘how to’ camping books, such as The Complete Idiots Guide to RVing or perhaps RV: RV Living with Kids. Make sure you are comfortable driving and backing up the RV before you head out. It will be a lot harder to back it up when you are exhausted, trying to miss hitting trees, and with other campers watching. If you have to, go to a large parking lot and just practice backing up, turning around, and hooking up the RV to your truck multiple times. It will make you feel like a pro when you can back into your campground the first time. Try to think ahead to what type of tools you might need on the road and/or spare parts. Having a basic tool set, duct tape and some WD-40 will go a long way when you are out in the middle of nowhere and something breaks down. Better go ahead and purchase the manual for your model of RV, that way you can find and diagnose things when they do break. Or at least tell the repair guy what broke, so you can anticipate the overall cost to fix it. Start to think about your budget while traveling. Will you be moving from campground to campground every few days, or are you planning on staying in one location for a longer period of time? Generally the largest part of the budget will be spent on fuel, so staying in one campground longer will be advantageous on your overall spending. Food can tend to be a big budget item as well. If you plan on eating out every night, that will start to add up over time. However, if you have an RV with a usable kitchen in it, cooking meals in the RV for a week might end up being the same cost as going out to eat once or twice. What to pack? Depends a bit on your personal preferences, but also how much space you have to put clothes, shoes, dishes, and other various odds and ends. You really only need enough clothes for one week at a time, but be sure and pack a few cold weather clothes as well, or vice versa. Even if it’s warm in your hometown, driving into the mountains and sitting around a campfire in the evenings could be quite a bit colder. Many RV campgrounds have a washer and dryer on site, so it’s not too much of a hassle to get laundry done every week or two. There are a million different things to check before you head out onto the road, so customize the checklist to fit your individual needs. With an RV, you can go just about anywhere. It just depends on what you want to see. Try to have a basic idea of where you are headed, and then depending on your planning style, just start driving! You can make reservations at many of the campgrounds online, but some are a first come first served type of arrangement. If you are planning on heading somewhere in peak season (ex. Florida during spring break), it would probably be a good idea to plan ahead and make reservations. If all else fails, and you show up and can’t find a place to camp, many large box stores (ex. Walmart) will let you stay overnight in their parking lot, just make sure and ask first. It may not be the most ideal place, but at least you can get a good night’s sleep, and wake up fresh in the morning and go look for a campground with a vacancy. Depending on your traveling style, make sure and bring either a map or a gps (or your basic smartphone). Especially if you plan on driving through any large cities, a gps will help navigate you through the maze of off and on ramps, and let you know ahead of time if the exit will be on the left or the right. When driving a rig that is larger than a basic car, having some time to move over five lanes will really help to keep your sanity (and marriage). I would recommend always having a paper map atlas for backup, in the event that the gps sends you the wrong direction, or you simply want to peruse what is in your general location. If you are planning on visiting any of the national parks while on your trip, check into purchasing a national park pass. If you visit at least 3 national parks in a year, it will pay for itself! For example, if you end up going to the Grand Canyon, there are several other national parks in the same area which you definitely don’t want to miss, so just buying a pass for that area will be worth it! Before heading out, it might seem a bit bewildering trying to figure out where you will camp the first few nights, or rather for the whole trip. Looking through websites, there are many different definitions with the word ‘campground’ in them, but they are all a bit different. An RV resort is the ultimate in luxury RV camping. They will have many extra amenities available, such as: Wi-Fi, cable tv hook ups, swimming pools, and possibly many other extras. The resort might be gated, and you should probably have a nicer or newer RV to try and camp in one of these. It’s possible that shuttle buses to various nearby locations will be provided, so you don’t even have to detach your car you’ve been towing. RV parks tend to be a bit more outdoorsy or park-like. There will be less ‘extra’ amenities; however the actual campsites might be a bit more secluded and more surrounded by nature. There should be room for a larger RV, but call ahead just in case. There may be a limited number of larger RV campsites available, and you might be able to reserve one in advance. RV campgrounds are much more primitive. There may or may not be power hookups, sewer and water available. The sites might be smaller, and probably aren’t paved. This could be a cheaper option, but might not offer all the comforts that many RVer’s are familiar with in the everyday travel scene. A campground might be just that: somewhere for just tent campers. Or it might be a full blown campground with room for RV’s and tent campers alike. It’s definitely a hit and miss, so you will want to check out a generic campground before driving your RV down a dirt road and either getting stuck, or not being able to turn around. Better to be safe than sorry when it comes to driving a large RV. So you are pulling into your first campground with your RV, what is the proper etiquette or routine you should follow? 1. First off, make sure and check in at the office (should be easy to find) to get a map or description of where you will be camping. If you have a larger RV, it might be a good idea to walk down to the campsite and give it a look, to plan the best way to maneuver your RV into the site. Ask what amenities the campsite might have available (washer/dryer), and double check if there is a password for the Wi-Fi (very important!). Also check if there is a designated quiet time in the evening, you don’t want to annoy the neighbors on the first night there. 2. Time to back (or drive) the RV into its’ overnight space. If you are backing up, and have a travel buddy (aka wife, husband or simply a friend), it might be worthwhile to invest in walkie-talkies, so someone can stand outside and make sure you aren’t about to back into that hidden tree or railing. 3. Next step would be to level the RV. Leveling is important for several reasons, but if you want your refrigerator to work, the RV needs to be level. You also don’t want to sleep with your feet higher than your head, or walk around in an RV that is sloped one direction. Park the RV and then check the level in the fridge (or purchase leveling units that you can attach directly to the sides of the RV) to see what needs to be done. Always level the RV side to side first, and then front to back. You can simply use 2×10 boards, and put them under the wheels (drive slowly when backing up onto the boards) until you are at the desired level. Or you can purchase leveling blocks, where you simply back the RV slowly onto them and they self-level. 4. Stabilize the RV: Unless you want the RV to rock back and forth when you walk around inside, you will want to stabilize it. This can be done by lowering the scissor jacks which are generally attached to each corner of the undercarriage of the RV. If the ground is sandy, make sure and lower the jack down onto a small board to help stabilize the jack. Lower all jacks, and then double check that the RV is still level. 5. Walk around your site and look for all the hookups. A. Power hookup (aka ‘shore’ power): Usually is 120 volt A/C (alternating current). Generally most appliances in an RV run on 12 volt A/C which is run off a battery. When plugged into shore power, a converter converts the 120 volt to 12 volt while also recharging the battery. B. Water hookup: a simple hose will attach to both the connection on the RV and the campground water output. Hook them up tightly, turn the water on, and then double check that there are no leaks at either end. C. Sewer hose: The sewer hose is a flexible plastic pipe that you will connect both to the RV and to the in-ground discharge tank. Make sure both ends are secure before opening the valve to empty your sewer tank. A good tip would be to empty your sewer tank, and then discharge your gray water (shower and sink water) through the sewer hose, to help clean out the pipe. Wear gloves while doing this, just in case there are a few drips. 6. Secure the wheels by placing wheel chocks behind the wheels, so the wheels are less likely to move for any reason. If you are parking a motorhome, make sure and put the transmission in ‘park’ and set the parking brake as well. 7. Now you are ready to set up any awnings or various pop-outs that your RV has included in its’ design. 8. Set a few lawn chairs outside and start enjoying your campsite! 9. Do everything in reverse when you are leaving your campground and headed onto your next destination. So you have an RV, what should you be doing to keep everything running and in excellent condition? Let’s start out with some simple tips and suggestions, some can be done even while in the campground. 1. Clean your water tanks: this is important to do several times a year, just to make sure that the water you are drinking is safe. A. First of all, fill your water tank until it is almost full. B. Then turn the water heater off, and make sure you wait at least 30 minutes until the water cools completely. C. Measure ¼ cup of bleach for every 15 gallons of water in your tank, and mix that into a gallon jug of water. D. Add the bleach/water solution to the water tank in the RV. E. Opening one faucet at a time, run water through the faucet for 2-3 minutes. F. Top off the water tank again, and wait at least 3 hours before the next step. G. Completely drain the system by opening various faucets again. H. Fill the water tank completely, and empty the tank one more time. I. Fill the water tank: it should now be clean and the water is safe to drink. 2. Protect the appliances and computers in your RV by purchasing a surge protector. Depending on where you are camping and plugging in your shore power, the campsite power could be a bit flaky, in which case intermittent surges in power are possible. Protect your investment wisely! 3. If you tend to accumulate things while travelling, once a year take your RV out and weigh it at a weigh station (or U-Haul location). This is to ensure you do not exceed the gross vehicle weight rating (GVWR). If the trailer is too heavy, it tends to wear out the tires faster and can put added strain on your vehicle’s transmission. 4. Be sure to maintain the brakes. They are something you tend to not think about, until they stop working. Trying to stop a large RV without brakes would be a disaster in the making. 5. Be sure and use biodegradable toilet paper (tp). This might seem like an obvious suggestion, but using typical house tp can lend the sewer plumbing to get clogged. And that is not something you want to happen! You can purchase RV tp in many RV stores, or online in bulk, available here at Quick Dissolving Toilet Paper . 6. Always check your tire pressure before you head out on a trip. When pulling an RV, you might not feel a flat tire until it’s too late and the wheel is destroyed. 7. Batteries for an RV tend to last 3-5 years, so make a note of when you purchased them last, and replace them before they completely wear out (which will always happen in the most inconvenient place and time). 8. Once in a while check the water level on the batteries. If it is getting low, fill it back up, but only use distilled water. Be cautious when doing this, as battery acid is caustic. 9. If you have pop outs on your RV, be sure and lubricate the rails once or twice a year. If not, you will be listening to a very annoying squeaking sound every time you extend the pop out. 10. Look online for various RV forums and start reading. You might be surprised that someone else has had the same problem, or has a question that you can answer. Winterizing your RV can also fall under regular maintenance. If you plan on parking your RV during the winter, and leaving it for several months, there are quite a few things you should do before you leave it in storage (or your driveway). 1. Don’t forget to service the generator for your RV (if you have one). The oil and filter need to be replaced, and the generator should be run regularly, even when the RV is not in use. This will prevent gunk from building up in the carburetor. 2. Remove all canned food and other food from your RV. Canned food tends to freeze in cold weather, and all food will attract unwanted bugs or even vermin. 3. Be sure and inspect your roof seals and seams. Do this every 6 months as well. It would be preferable to put a cover on the roof when the RV is not in use, as sun damage and subsequent water damage from a damaged roof can be incredibly costly. 4. Take the batteries out of the RV and store them inside or someplace warm. This will help to extend the life of the battery. 5. If leaving the RV unoccupied for a long period of time during the summer, leave the roof vents open to allow hot air to escape. With all the vents and windows closed, an RV is just a giant oven, with temperatures rising about 130 deg. F. This tends to wreak havoc on door and window seals, and can damage flooring and various other parts of the RV. Just make sure to have the RV in a garage if you do leave the vents open, or you might have water damage instead of heat damage inside your RV. Being able to keep bugs and vermin from entering your RV (at any time) will also keep your home away from home in top shape. There are many tips out today to assist you in keeping your RV bug free, some of which are referenced here Keep Bugs out of Your RV. 1. Walk around the outside and inspect the walls and undercarriage. Look for any holes or gaps where mice could get inside. All it takes in ¼ inch gap for a mouse to enter your home. Plug any gaps you find with expanding foam. 2. Check around the windows and screens. You might need to take the screen off to inspect the window. If there are gaps around the screen, use caulk or tape to fill in the space. 3. If you are having a problem with spiders, introduce citrus smells inside. Citrus tends to repel spiders, so rub orange peels on the counters or in corners, and spray a mild water/lemon solution in cabinets. 4. Place ant bait houses in key areas: under the sink, in various storage compartments and closets, and in drawers or areas around any food. Ants can be very difficult to eradicate once they have infested your RV, so you want to stop the one or two ants you find from becoming thousands. 5. Place cedar shavings or pieces in closets and drawers to repel moths. It will not only keep moths from eating your clothes, but they smell quite nice as well. 6. Take bug repellent powder (or spray), such as Generic Talstar Insecticide , and sprinkle around the outside power cable and around the RV: in any location where bugs might tend to find a way inside. 7. Make sure and store non-perishable food in plastic containers: many types of bugs and vermin can easily chew though cardboard or plastic bags. Bugs and vermin are not something you want to have to deal with, so it’s better to be proactive than wait until they have completely moved in! If you tend to go RVing quite often, there are quite a few tips you can use in your daily life to save money and be able to stay on the road longer, according to RoverPass. 1. If you drive about 55 mph or less, you will have better gas mileage overall. There is no reason to be in such a hurry, you are on vacation: enjoy it! 2. Avoid driving in high winds; it will really decrease your vehicles fuel mileage. 3. If you have a gas company credit card or a rewards card for a specific gas station, try to only stop at those places to fill up. You will save money on every gallon of fuel, or accumulate points that can be used for things in the future. It will all add up over time. 4. Make sure and empty the water tank before heading out on the road. You may not think about it, but water weighs 8.3 pounds per gallon, which tends to add up quickly if the tank is full. A full tank will noticeably decrease your mileage. 5. Install an antenna, such as the KING OA8200 Jack HDTV Over-the-Air Antenna with Mount and Built-in Signal Meter , on the roof to pick up over the air (OTA) free TV signals. It saves money from using cable hookups, and you can still watch many of your favorite shows. Splurge on Red Box or use Netflix to supplement your viewing programs if you really need to watch that specific show. 6. When travelling, stop by the local visitor’s center and ask what free museums or events are located in your area. Many museums are free, or free specific days during the month. It never hurts to ask, and you might learn something in the process. 7. If you are planning to be in one location for several weeks or a month, generally campgrounds have a different rate for those staying longer periods of time. It might cost $20 a night, but if you stay for the whole month it is only $300. Always good to ask what rates are available. 8. Join several RV clubs where memberships are offered. Good Sam, Passport America, and RoverPass are all large organizations that offer incredible benefits to the frequent RVer. If you enjoy being out on the road, but aren’t sure how to bring in an income to supplement your expenditures, here are some ideas on how to work while out on the road. If you are good with people, and enjoy being in one place for several months at a time, you should think about being a campground host. Find more information about being a campground host here: Campground Host . Most campground host jobs are seasonal, but in some of the warmer areas in the US, they might be year round. You will manage the campground site for a specific period of time in exchange for free rent to stay there. Typically managing the campground is composed of: meeting other campers and collecting fees, helping campers solve any issues with their site, and doing some light maintenance and/or cleaning the restroom facilities on site. Not a bad tradeoff for a free place to stay. These will be campgrounds on private and government lands, such as in national and state parks. Some RVers simply travel from one job to the next, and almost never have to pay for campground fees. There are an increasing number of jobs available which simply require you to have an internet connection, and you can work from home. Whether home is a brick house or an aluminum RV, it shouldn’t be a problem. If you are headed out on the road with your spouse and several children, but aren’t sure how the kids will adapt to the RV lifestyle, don’t stress: they will be just fine. Here are a few tips to help your children settle in to traveling out on the road. 1. Bring plenty of things to do during the drives between campgrounds. Kids will eventually get bored and start to cause trouble with their siblings (we all did it growing up), so providing games, books, movies, and travel games will help to pass the time. 2. Get an atlas for each child, as well as a highlighter, and let them figure out where you are traveling as you drive though each state. No longer should you hear the dreaded, “Are we there yet?” Now you can start asking your children how long until the next stop, and let them calculate the distance. It’s a win-win on both sides. 3. Make sure to take plenty of bathroom breaks, and give the kids a few minutes to burn off some excess energy. 4. Drive at night: you won’t have to stop as often, there will be fewer cars on the road, and your kids will sleep the night away and not realize how long of a drive they just experienced. 5. Try and find a campground with some sort of activities available. Even if it’s just a location with plenty of room to play, or a nearby forest or field to kick the ball around, it will make the experience of camping that much more pleasant. 6. Make sure and have field guides available for your children to use while at the campsite. If you are camping near a beach, get a seashell guide. That way your kids can spend hours looking up and learning about all the shells they were able to collect at the beach. 7. Make sure your child has a place of their own in the RV. Even if it is just a bunkbed, that bed is theirs and theirs alone. They need a place they can retreat to for some quiet time, reading, or just to get away from everyone if they need to take a nap. Buying, outfitting and taking your RV out on road does not have to be a stressful experience. Just be sure to research and take your time looking for that RV that will fit your needs, and know what your budget will be. Make sure and keep the maintenance up on your RV, and do a walk around periodically to ensure everything is in tip top shape. Write checklists before you head out on the road, to ensure nothing in forgotten. Make sure and follow the steps to winterize your RV, and to keep bugs outside where they belong. Budget your money wisely as you travel, and perhaps even look for odd jobs or be a campground host for several months to supplement your income. If traveling with kids, make sure and think ahead to what they might need on the long drive, and bring games to keep them busy while camping. Overall, don’t forget to get out there, and to enjoy the journey!